Here's why amusement park operator Cedar Fair and REIT Iron Mountain are worthy of high-yield dividend investors' consideration. What's not to love about dividend stocks? Dividends can generate income streams, and be reinvested to grow your total number of shares, which can power your total capital appreciation over the long term. Once you get past the somewhat higher-than-average dividend-yielders, however, the risk level among dividend stocks generally increases. That's certainly true in the 5%-plus-yielding territory. However, there will always be some stocks among this group that are less risky than many of their brethren. Two such stocks that are worth buying -- or at least putting on your radar -- that have beaten the market over the last 10 years are Cedar Fair (NYSE:FUN) and Iron Mountain (NYSE:IRM). Cedar Fair is the third-largest operator of amusement parks in the United States. It owns and operates 11 amusement parks, two outdoor water parks, one indoor water park, and five hotels. Cedar Point in Ohio is its flagship park, while the other parks were acquired from 1978 through 2006. Along with Ohio, it has parks in California, North Carolina, South Carolina, Virginia, Pennsylvania, Minnesota, Missouri, Michigan, and Toronto, Ontario. The company also operates the Gilroy Gardens Family Theme Park in California under a contract. Roller coaster at Dorney Park, Allentown, PA. Image source: Cedar Fair. Cedar Fair is structured as a Master Limited Partnership (MLP), rather than as a corporation. MLPs are taxed at the unitholder level and generally not subject to federal or state income tax. This structure allows Cedar Fair to pay out the majority of its earnings to its owners without first paying significant federal and state taxes. A big thing to love about Cedar Fair's business is that it has huge barriers to entry. Even a very deep-pocketed company that was able to find a suitable piece of land and get all the required permits would almost surely shy away from building a new amusement park too close to one of Cedar Fair's parks because most regional economies can't support more than one large regional amusement park. This dynamic essentially makes Cedar Fair's parks regional monopolies, providing the company with solid pricing power. Another major thing to like about Cedar Fair is its CEO, Matt Ouimet, who took over in 2012 when the company's longtime CEO retired. Ouimet had the perfect training to run Cedar Fair: His last position during his 17-year tenure with Disney was as president of Disneyland Resort. In 2016, Cedar Fair's year-over-year revenue climbed 4%, adjusted EBITDA (earnings before interest, taxes, depreciation, and amortization) rose 5%, and net income per unit soared 58%. The company achieved records for its three core metrics: Attendance increased 3% year over year to 25.1 million visits; average in-park guest per-capita spending increased 2%; and out-of-park revenue rose 6%, driven by higher occupancy rates and average daily room rates at Cedar Fair's resorts. Cedar Fair's fat 5% dividend is supported by its dependable and robust free cash flows. The company has paid a dividend for 30 consecutive years, and has increased its dividend in each of the last five years. Iron Mountain stores records and other items and provides information management services to companies and government entities. It's also been expanding into related operations, such as data centers, which provides it with more growth potential. This industry leader owns more than 1,400 facilities across 46 countries and counts more than 94% of the Fortune 1000 companies among its more than 230,000 customers. Iron Mountain's core storage business is very stable. No matter what the economic environment, companies need to maintain records for a plethora of reasons. It's also considered a best practice from a business continuity standpoint for organizations to backup their computer data regularly and store the backups offsite. In addition to customer diversification and a stable core business, Iron Mountain benefits from its core business having relatively low maintenance costs. In 2016, Iron Mountain's revenue increased 16.5% as reported and 19% in constant currency, driven by its May acquisition of Recall. Normalized funds from operations (FFO) per share -- a key metric that's akin to earnings per share for REITs -- declined 8.6%. However, this was driven by large costs related to the Recall acquisition. As Recall is further integrated, Iron Mountain expects to realize increased synergies, which should boost FFO and other key metrics. Iron Mountain has been in business since 1951 and a publicly traded company since 1994, but it only converted to a real estate investment trust (REIT) in 2014. Thus, it has a relatively brief history of paying generous dividends (REITs are required to pay out at least 90% of their income as dividends due to their preferential tax treatment). The company has raised its dividend in each year following its conversion to a REIT. Neither Cedar Fair nor Iron Mountain comes without risks, though Cedar Fair is the more dependable stock from a dividend growth potential standpoint in my opinion. Moreover, I believe it also has better total capital appreciation potential (stock-price appreciation plus dividend). 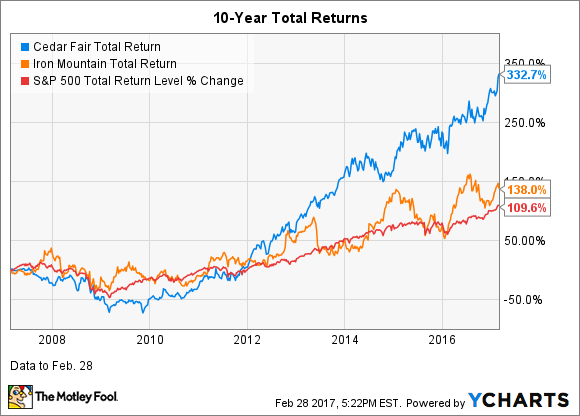 While past performance isn't indicative of future performance, long-term past performance does often reflect a company's sustainable competitive advantages and its management's ability to capitalize on those advantages. With that said, the following chart shows how the total returns of both stocks have stacked up against those of the S&P 500 over the last ten years.